After scourging the net for down-to-earth, fun and practical t-shirt blogs, we decided to put together a list. 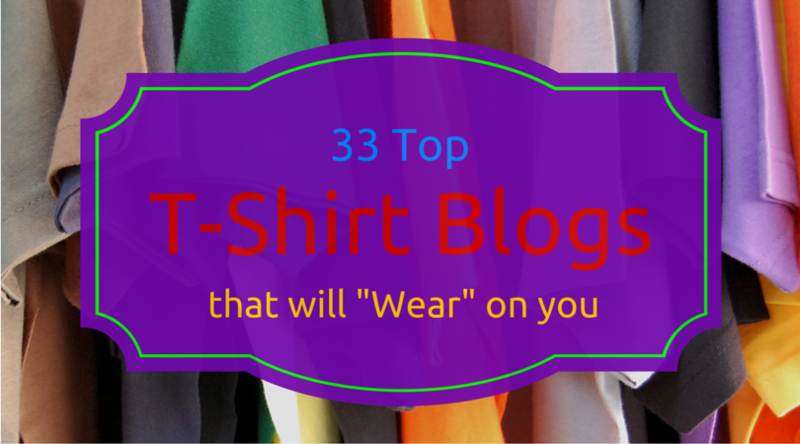 Here are the 30 top t-shirt blogs on the web. It’s well known that there is a multitude of t-shirt blogs out there, so we found the “best of the best” and brought them to you in one nice little package. Whether your interested in t-shirts, a t-shirt enthusiast or into creative design, these blogs will be right up your alley. This is a nice blog that is interactive. They do theme based derby’s every few days. Basically users can submit their own designs based on the specific theme. Themes vary from cats, vintage, emotions to robots and everything in-between. The winners design will be included in a sale that follows shortly there after. 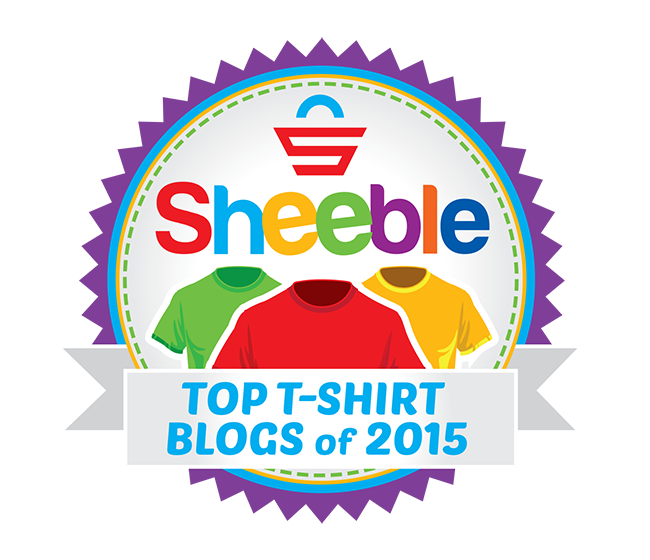 An all around great t-shirt blog that covers a wide variety of topics. The articles are just as creative as the designs that they cover and the enthusiasm is top notch. They provide plenty of design tips and throw out the occasional contest for users to participate in. Fashionable t-shirts featuring the latest trends. Dressing for the seasons will be a piece of cake after visiting this blog. There is also some great informational blog posts centering around boosting T-Shirt sales. 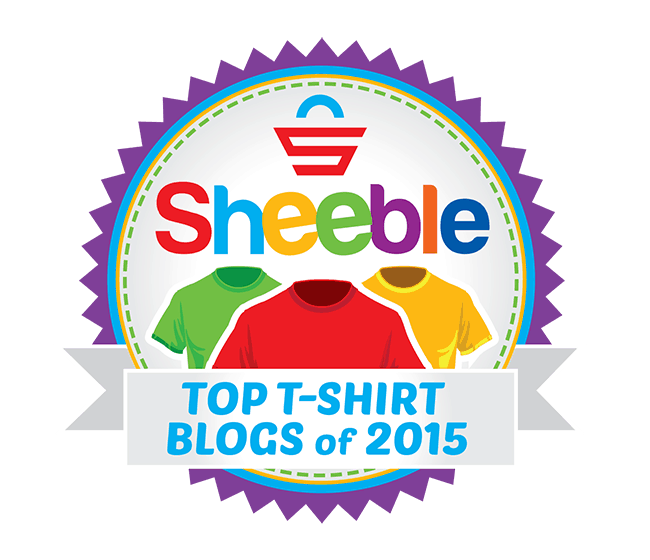 Are you a proud geek looking for a T-Shirt blog? This is it. I am pretty sure this is where Dr. Sheldon Cooper himself would hang out. All kinds of Geeky designs and some giveaways can be found here, and if you time it right you can end up winning a free T-shirt. Definitely worth checking out. This is pretty much the official T-Shirt forums of the internet. Nuff said. You can find discussions on here about general T-Shirt sales, Designs, E-commerce website designs, and the list goes on and on and on. Not to mention that the users range from top notch T-Shirt Gurus to regular Joe’s that enjoy this niche as a hobby. A blog that wraps around comics/sci-fi and T-Shirt designs. A truly fun place to hang out. They also provide T-Shirt design contests along with an active forum. This blog is written and structured around team leaders. Keeping your team or organization on the same goal and moving in a harmonic balance is important. This blog has some great articles to help you leaders achieve this. Qwertee has artist appreciation months where they take the top sold designs and provide the winners with cash. Established in 2006, this t-shirt blog has made a nice presence in the design field. They have a good collection of blog posts with an insightful perspective of the designs that they cover. The cool thing is that the designs are unique looking and they cover a wide range of interesting topics. Truffle Shuffle has an awesome T-Shirt blog that is very interactive with their followers. They throw out a weekly retro movie list with all of our favorite movies from way-back-when. Back to the Future anyone? Along side of the movie list are t-shirts that they have designed for the actual movies. We have shirts already created and in stock that you may like. Shirtoid provides you with a collection of the best T-Shirt designs from around the web and places them all in one website. They also allow for user submission if you think your design can make the cut. Mintees has a knowledgeable community base which makes them a great source for finding and collaborating with other designers. There is a couple other sections of the website that are unique. One of them being a T-Shirt brands section where companies can display their brand along with their designs. 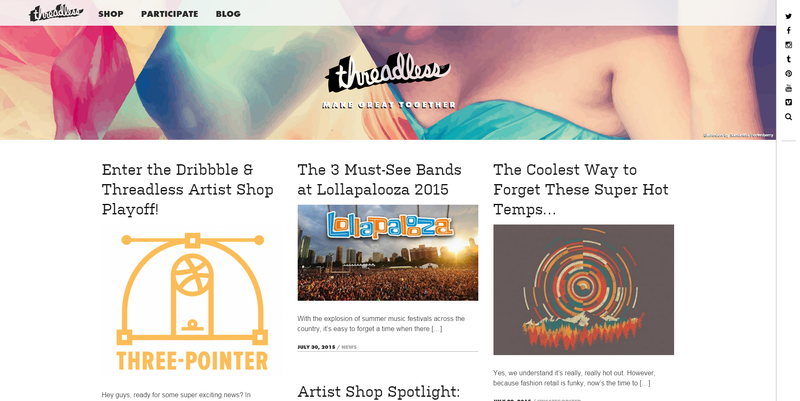 This magazine style website brings you all of the newest and coolest Indie style fashion, bands, artists etc. and places all of that right in front of your face. In one place. I easily spent an hour or two reading through their articles and was amazed at the uniqueness of the designs. If you want to stay up to date on all things Indie, this is your new hangout spot. This T-Shirt blog brings you all of the daily T-Shirt news. Want to stay up to date with the new designs and who’s doing what? This is where you want to be. A very nice German T-Shirt blog. One of a kind for the German speaking fans. They offer a nice array of up-to-date T-Shirt designs. Printsome has a an awesome blog! The well written articles vary from T-Shirt printing techniques to Marketing. Definitely worth taking a peek. TeeMagnet is pretty much a “cool shirt” curator. You can find new T-Shirt designs on here from a variety of different categories. Cottonable aggregates funny designs from T-Shirt companies that are worthy. They have quite the extensive collection going on and all of the designs are pretty awesome. If you happen to run across a shirt that you like there is a link back to the website for easy purchasing. This is a great resource for anyone, definitely worth bookmarking. The website provides very in-depth articles about how to start your own T-Shirt business. Truly a one stop shop for information on this industry. Preshrunk has been around for a little over a decade. 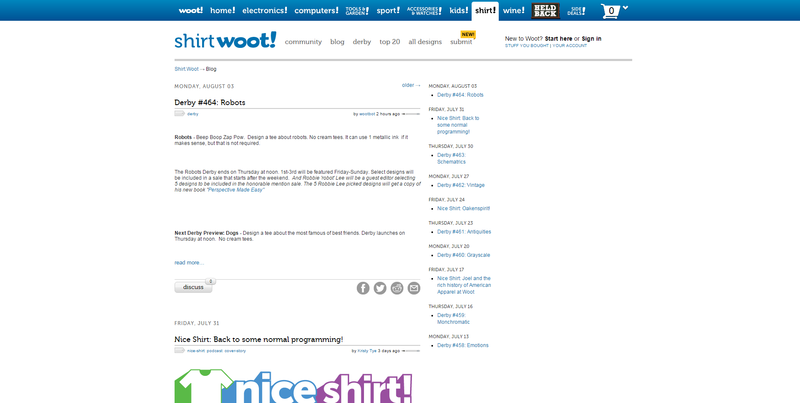 They post funny T-Shirt designs and write up clever articles on each shirt. By far a good place to visit and browse through their pages. T-Shirt Magazine has a very attractive UI with up-to-date articles. You can easily keep up with news in the clothing world anytime of the day, very informative. TeeHunter… they hunt T-Shirts… awesome graphic shirts to be exact. Very amazing variety of designs, from retro to cool to wow! This is a great blog that currently has an extensive list of almost 26,000 t-shirts. They also provide some tutorials for creating cool designs and nice interviews with design artists. This blog posts all kinds of group T-Shirt ideas. They provide a nice spread of designs for different occasions. Pop Culture Tees is a blog that puts out up-to-date articles on T-Shirt trends and funny designs. The cool thing is that when you find a shirt that you like, they provide you with an approximate cost and a link to the designers website. Companies send Tee Reviewer a t-shirt and in return they receive a (sometimes great and sometimes not so great .. but always honest) review on their blog with a few words about the company the shirt was sent from. For a small fee they will also review a website. Pretty dang cool, huh? Fancy Tshirts blog showcases some fantastically unique shirts and links to where you can purchase them from. defunkd’s blog features categories from celeb news, personal vintage experiences, even some how to’s. What I found pretty great about the site was that you can buy, sell, or just show off your vintage tees. Can you say ca ching? Teerater will give you a good laugh with their posts about several funny t-shirts genres including but not limited to Ghostbusters, Dinosaurs and Beer. T-shirt Alert has some great reviews for some of the coolest T-shirts around as well as T-shirt screen printing kits. Always wanted to make your own T-shirts? Check out this blog for some great ideas and information about how to! Compete-tee-tion follows the biggest news in the t-shirt design competition world. Everything from reviews of new t-shirt releases to information on the newest contest opportunities. Another cool thing about this blog is that they have a new post everyday! Doodle Dojo has some pretty damn cool shirts designed by the creator of the blog, Dan. He has an awesome array of geeky, funny, pop-culture and some other really creative designs. My favorite was Hershel’s Walker Barn design inspired by the show Walking Dead. Very clever and unique designs you won’t see made by anyone else. Geek Shirts HQ provides news, articles, reviews and contests all about t-shirts! While they started out geeky, they now cover a wide variety of genres, with special tribute to their geeky roots. The T-Shirt world is about expressing yourself in a way that everyone you encounter will see. Designers love to create that expression. These blogs love to spread that expression. That concludes our top T-shirt blog list. I hope you can enjoy the time and effort these blogs have put into doing what they love to do. Let us know your favorite T-Shirt blogs in the comments below. Thanks The Sheebler for sharing valuable insights on T-shirts blogs. These resources are really inspirational for bloggers, fashion freaks and those who are into the business. I would like to add one more to the list – https://yourfavoritetshirts.com/blog/. Hope you people out there will enjoy it. Great and useful information you have shared with us. Sometimes we always look at such blogs basically for our research and new things for our business. Thanks! Thank you for sharing. Good list.